Harry is Number 17 in the Picture taken during the 1957 SAAA Marathon which he won. (Also in the photo are George King, Emmett Farrell, Andy Fleming, Hugo Fox (head only), Andy Brown and Ronnie Kane. I first met Harry when I was about to run my first Edinburgh to Glasgow Relay race. I got on to the bus for the third stage and was hardly into my seat when a wee man got in and sat beside me. We didn’t know each other and had never met but he started in right away saying he was delighted to be running the third stage for the first time ever – it meant he’d be able to visit the Forestfield Inn for the first time in ages at the end of the fifth stage! His patter was terrific and his manner infectious: I lost a lot of the nerves and was feeling quite positive and positively cheery when we got off the bus to start warming up. We met frequently after that for almost 50 years and at one point when his son was training with our group at Crown Point, we took turn about buying the tea and fudge doughnuts when the guys were out for their jog after the session. 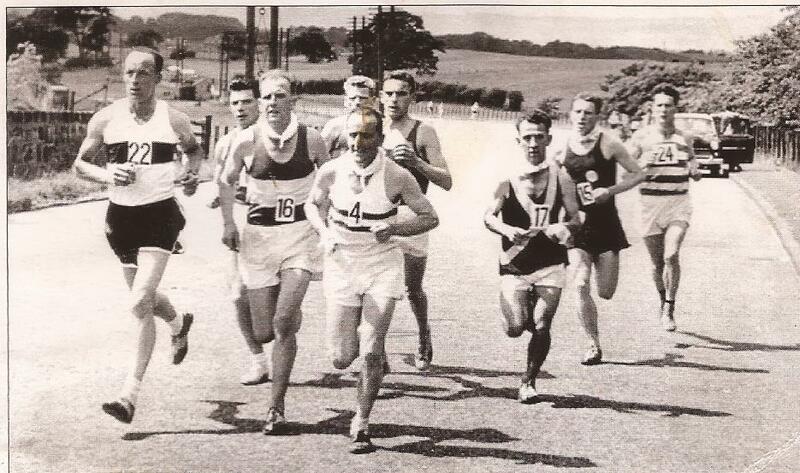 Harry was one of the most popular men in Scottish endurance running in the 50’s and 60’s and even after he retired he went to all the races to see his son, young Harry, race and was always in among the chat with the runners, with the officials and with the supporters regardless of their age or club affiliation. My first meeting with him was at the start of the 1958 Edinburgh to Glasgow Relay. I got on the bus for the third leg and immediately afterwards Harry plonked himself on the seat next to me and started chatting away. Apparently he had been asking for that stage for ages so that he could run, get dressed and be ready for the Forestfield Inn at the start of the long sixth stage. Everyone remarked on his height because he was so small – he could certainly give Dunky Wright a run for his money in the wee-ness stakes! But given his size and the size of his heart he must have had a huge power : weight ratio. “The 1957 race took place on the22nd of June finishing again at Meadowbank and Harry did indeed achieve his ambition and become the only man to win the National Cross Country and SAAA Marathon in a single year. The training Harry did was rigorous. ‘I usually averaged 130 miles a week which included running three times a day, gradually adapting myself to running 5:30 a mile which was race pace. This was done with the help of my friend who came along on his bike. He used to time each mile which was good because I was able to increase the pace and come back again to a steady 5:30 pace. The longest run I ever did was 33 miles. I usually did 20 miles which included fartlek sessions. All this training was done in the morning at 7:00 am before starting work and then again at lunch times and again in the evening. During training sessions I never ever drank any fluids. My diet included at least three steaks a week one of which was eaten about two hours before a race. I usually wore black sand shoes from Woolworths and put a Boots the Chemist’s insole in them. They did not last very long as the roads where I trained were very rough. The weather for the race was cold, mainly dry, and at times wet – ideal conditions. For the first ten miles I sat in the pack watching everybody. Shortly afterwards I kept asking when the next drink station was making out that I was desperate to take water on board which I wasn’t. This was part of my race tactics. When we approached the watering station the other runners moved across to get a drink expecting me to do the same, but to their surprise I never took any and put in a kick that left the pack. Most of the runners dropped their water to chase after me. I met my coach shortly after the break and said “Next stop Edinburgh!” As I was out on my own I started to run at my own pace and pull further and further away. At 23 miles I took a stitch after stepping down from a particularly high pavement and had to ease down for a bit. It wasn’t until I entered the track that someone told me I had a chance of beating the record. I took one final spurt and just managed to beat it. If I had known earlier I would have taken more off the time.’ Harry’s 2:25:44 broke Joe McGhee’s championship record by six seconds. Hugo Fox was second in 2:28:57 and George King third in 2:37:20. ‘After the race I ate a couple of oranges, had a shower and then went for a three course meal. My time was the fastest in Britain and the second fastest in the world that year’.